The SC3 steam cleaner is a lightweight, supremely easy to use piece of kit that's brilliant for making flat surfaces sparkle and for getting at those hard-to-reach areas that gather gunk. Perfect for family homes, people with pets, those who hate both elbow grease and chemicals and the fastidiously clean. Quick, effective cleaning of hard to reach areas, without chemicals. Brilliant at blasting (literally) gunk from hard and softer surfaces. Packs away compactly, with storage space for accessories. Electrical cable could be longer to save plugging and unplugging. Not the best we've tried over large areas of hard flooring. The lightweight Kärcher SC3 EasyFix steam cleaner uses the power of steam to deep clean your home without the need for chemicals. We put it through its paces around a whole house, on flooring, on limescale around taps, on a paint-stained sink, and even on a grubby rug. Read our review to find out how we got on. Which surfaces will the SC3 EasyFix steam cleaner be suitable for? The SC3 steam cleaner is recommended for cleaning floors, taps, wash basins, wall tiles, windows and mirrors, extractor hoods and hobs. 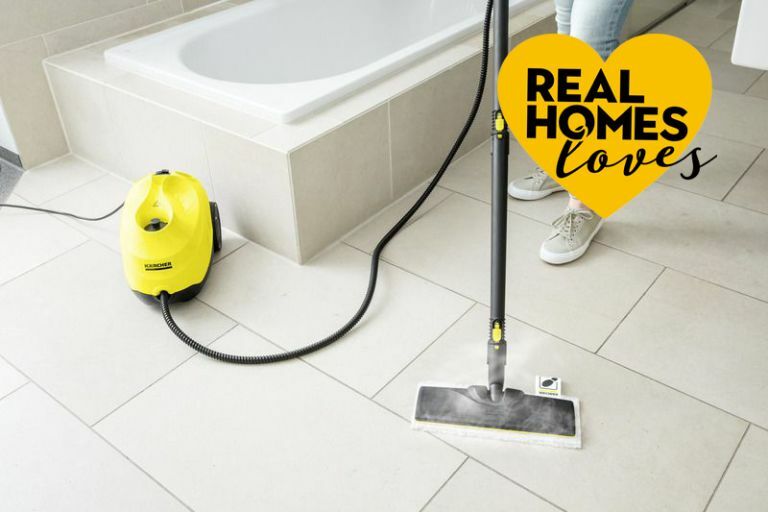 Use it to remove dirt, mould, limescale and stubborn grease from hard floors, oven doors and hobs, upholstery and carpets, and taps and tiles. What's included with the Kärcher SC3 EasyFix steam cleaner? 2m steam hose with gun. Steam flow regulation the on handle. Bathroom cloth set for the EasyFix. The biggest surprise was just how light the box the SC3 came in was – it boded well for the steam cleaner itself. I'd been on the lookout for a mighty but small steam cleaner for some time – one that could tackle the jobs I needed it to, but without the heft. As with other similar products, the initial instructions are illustrations – I'm not a big fan of this and I'm usually pretty impatient with set-up anyway, wanting to get straight on with the job as quickly as possible. But, after a little – and it was a little – head scratching, I'd assembled and got the SC3 ready to run. The instructions advise you to put no more than a litre of water into the cleaner body – but there's no measure or jug provided, so you'll need to be equipped with one before you start work. But I reckon any household that needs a steam cleaner probably already has one measuring jug in its kitchen. The great thing about the SC3 is how light it is. It might look and feel a bit like a conventional vacuum cleaner but it's as light as a newborn baby – actually, it's significantly lighter than my first. Its handle also made it super easy and comfortable to carry, although admittedly the body of the unit spent most of the time on the floor (it has wheels, so you needn't pick it up that much at all). If I had one complaint it is that, like many of these kind of cleaners, the electric cable is a little short. Okay, it's big enough to make it practical for whatever single job you're tackling, but if you want to use in different parts of a large room or over a whole storey, you'll have to unplug and plug it in again. Once turned on, the SC3 is quickly ready to start steaming. I'd recommend ensuring the steam nozzle is in the off position when you are waiting for the steamer to be ready – that'll avoid any nasty burns. I was also careful to ensure I'd locked the nozzle position to off when changing heads so that I couldn't mistakenly activate the steam. This action, by the way, is easily managed on the handle. So, down to the results. I used the detail nozzle of the steamer to speedily blast dirt from the nooks and crannies around my kitchen and bathroom: it tackled what I can only describe as unreachable gunk from the workings of taps, plug holes, tiles and appliances. The only thing to note is that the gunk doesn't evaporate, obviously, and has to go somewhere, so make sure that the surface behind the taps, for example, is protected or wipeable. I also used the hand nozzle (carefully) to clean my kitchen cabinet fronts, to tackle down the side of the oven (goodbye formerly unbudge-able gravy), and to make my tiles sparkle. Then I put the floor cleaning head on and tackled the kitchen floor – with good results, although I wouldn't qualify it as a deep clean – which might be due to the strength of the steam jets versus the size of the floor head and the thickness of the microfibre cloth, but that's just a guess. Next I took it into the utility room to try it on the paint-stained stainless steel sink. I've tried many cleaning products on the sink and not been able to remove whatever other unmentionable stuff the decorators recently left there – but with some persistence and the round brush, I'd say I got 80 per cent of it off. And the sink is almost shiny – for the first time since it was installed. I'll have another go at it once my tennis elbow clears up. Then, it was up to the lounge where I went off script somewhat – and probably way off the manufacturer's recommendations. I melted hardened wax around a fire surround (to discover that it reset almost as quickly as I could wipe it up – doh). I then turned my attention to a rug that (full confession) the dog seems to like to transfer his dry food to a piece at a time while he eats it. So, it's constantly dotted with a slightly sticky remnants. So, with little care for the outcome (it's a very old Ikea rug), I turned the round brush and steam on these patches. It's worth knowing that the last time I tried to clean them up, I spent a good hour with a scrubbing brush and detergent (giving myself tennis elbow). The steamer + brush combo had the patches off the carpet within five minutes. All these jobs had, by now, exhausted not just me but my reservoir of water (a light comes on to let you know this has happened – so make sure to keep an eye out – but it's pretty obvious because the steam starts to wane). In all, I'd say I preferred the SC3 for smaller, more detailed jobs – actually the ones that usually frustrate me because I don't like to use tons of cleaning products but sometimes they're the only way to get really stubborn dirt out of nooks and crannies. Will I be using it again. Yes, it'll be one of those appliances I fall back on every two or three months.